The Combined Federal Campaign of the National Capital Area (CFCNA) is the only authorized charitable-giving drive for Federal employees in the Washington, DC Metropolitan Area and the State Department employees overseas. When making a donation during in the campaign please think of our kitties and how your donation will help feed and provide necessary medical treatment. We greatly appreciate your support! Our CFC number is 23910. Donate by shopping through Adopt-A-Shelter.com. It doesn’t cost you any extra and the online stores where you shop will donate a percentage of your purchase back to Tails High. You can select from a massive list of participating stores which includes Amazon, Best Buy, Target, and Walmart. 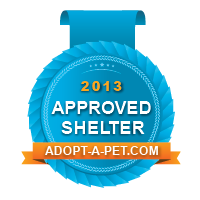 Click on the logo below or go directly to the Adopt-A-Shelter.com site and select Tails High from the list of participating shelters. Thank you, Petco Foundation, for your continued support.